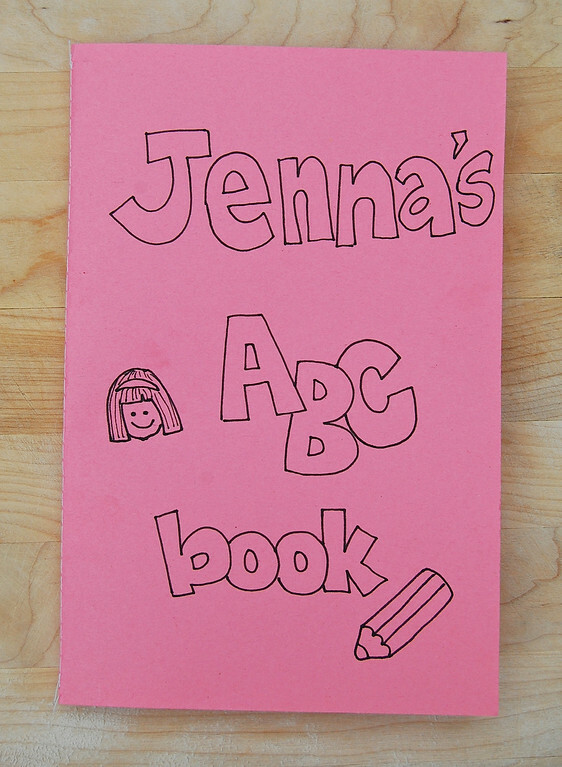 Alphabet copy books for the girls! 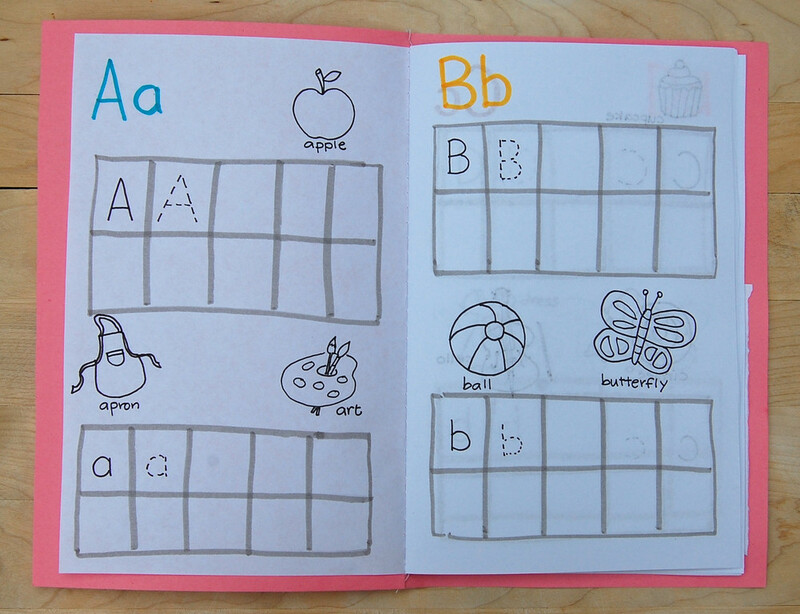 I made one for Emily a couple of years back, when she started showing interest in writing her ABCs. She was already writing her letters, but shakily, and kept asking me things like, "Mum, how do you write 'G'?" I initially wanted to go out and buy her a copy book, but was too lazy to actually go shopping. So I sewed paper together and made her one instead. And now Jenna is old enough for hers, too! Each page is dedicated to one letter. 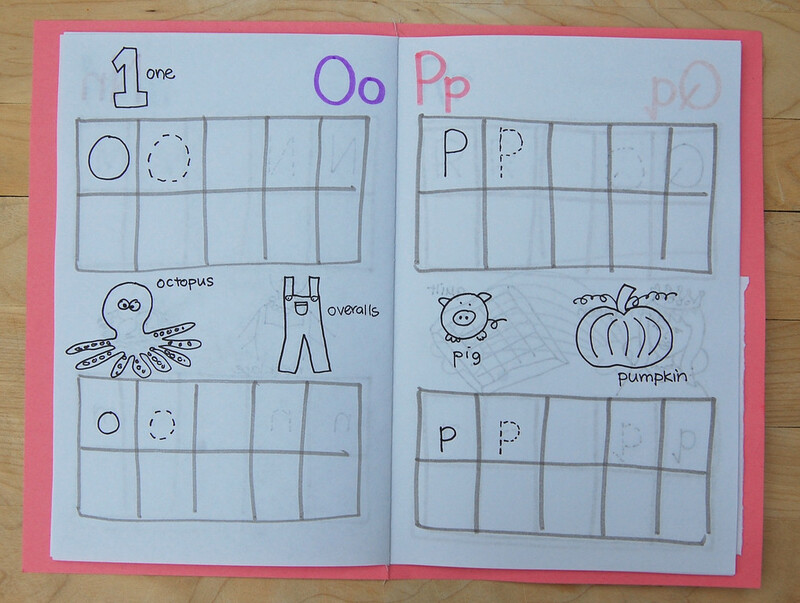 It has grids for the upper and lower case letters to be copied out, and pictures to color. 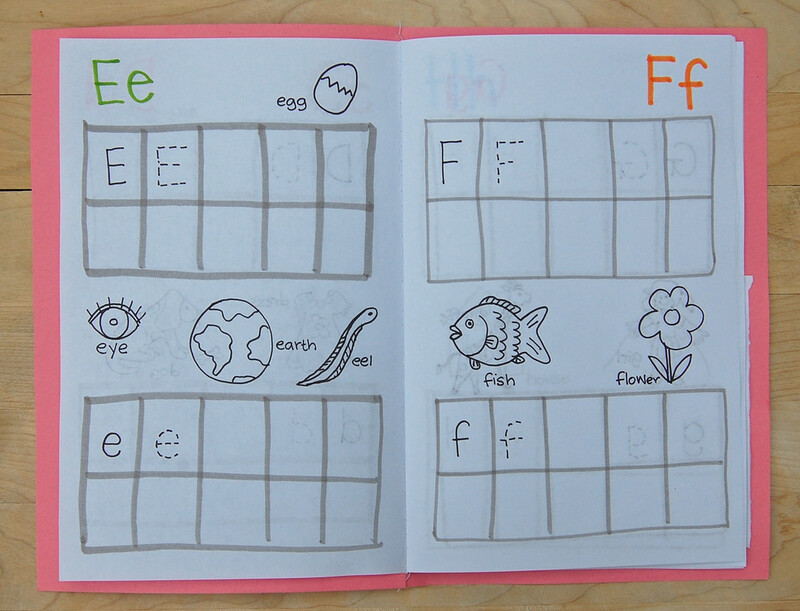 and eye, egg, earth and eel for E.
Obviously the kids don't have to explore all the sounds if they are more interested in just writing out the letters or coloring the pictures, but exposure is always good - they might pick up something useful without us ever knowing. 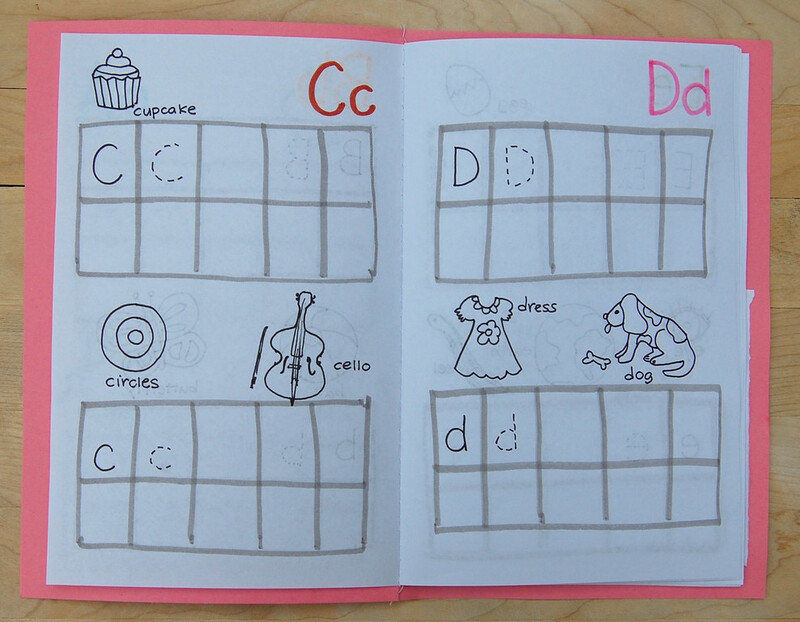 so she can stick one on each page she's completed. Jenna quite likes her book - she's at the letter "E" now. It's very interesting to watch how differently Jenna and Emily work through their books. Emily very slowly and assiduously filled and colored each page and stuck on a sticker before moving on to the next. Jenna has sped through five pages, writing out all her letters at top speed. 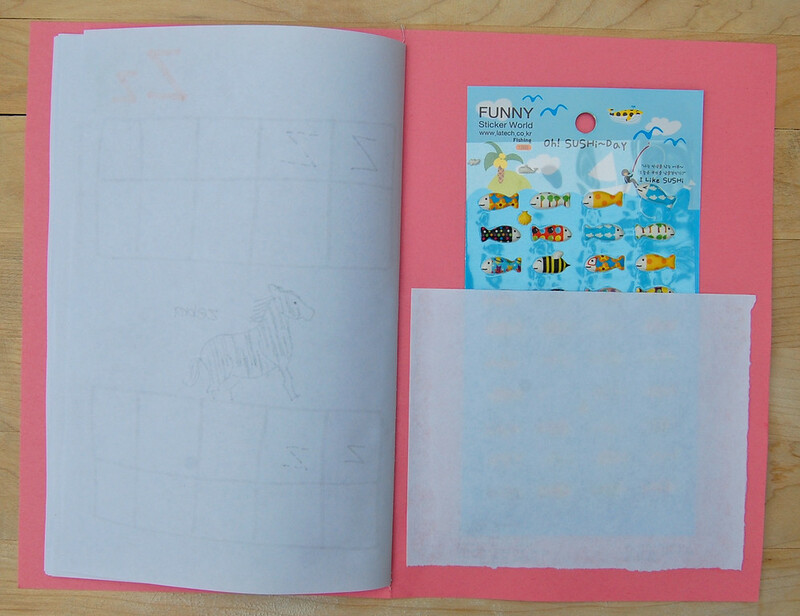 Then she used 8 fish stickers in one go, decorating 4 pages one after the other. She still hasn't colored any of the pictures, telling me she's saving them till the end. Can't wait till Kate is old enough for her book! P.S. The puffy fish stickers are from Korea, but I bought them in Singapore last year. They remind me of Lucy Cousin's book "Hooray For Fish", which we all adore. P.P.S. Blogger was a little messed up the past day or two, and a lot of us lost our most recent posts (temporarily, I hope) and affiliated comments. Sorry if you couldn't leave comments recently. Fingers crossed that everything will be back to normal soon! 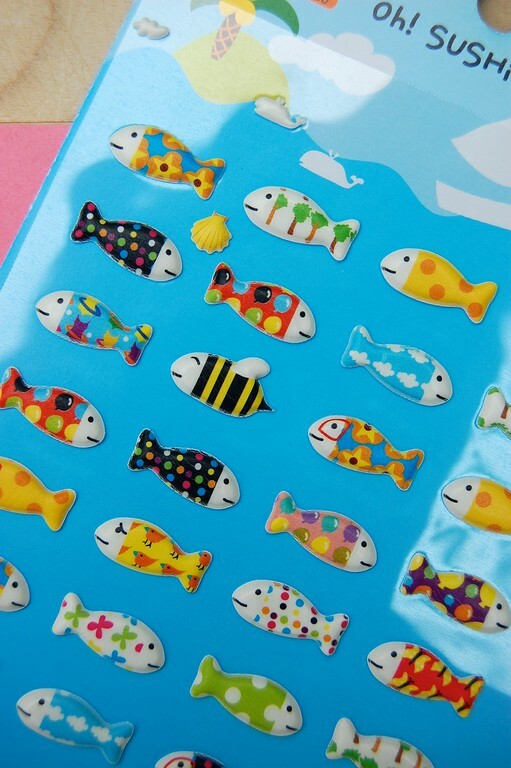 The puffy fish stickers are fantastic! Your daughters are so lucky to have such an artistically talented mother! Hey Margo! New photo! Beautiful! Thanks for the translation. And I'm so ticked you thought of me when you were faced with cardboard. Yes! Incidentally, I went to Costco today and didn't bring home any cardboard. Felt very ashamed. P.S. My girls still color those bookmarks, too. We have about a thousand at home. I've stopped laminating them because there are so many. This is awesome! I'm a teacher and just today I was browsing the 'teacher store' here and thinking of my teaching assignment next year. I saw a book almost exactly like this and thought, 'I can probably make something similar'. Your post is confirming that! Brilliant idea! Thanks for sharing and inspiring us all to make our own.